Happy 4th of July! This holiday falling smack in the middle of the week has thrown me for a loop. I woke up wholeheartedly believing that it was Saturday, straping my new camera around my neck with the intention of taking photos at the Saturday Noe Valley Farmers Market. Now that I’ve come to my senses, I’m really loving this mid-week day of freedom and independence. The sun is shining. I’ve got a kajillion things to do before I take off tonight to see my Sister Hazel, but I’m already off to a good start. Tomorrow I’ll be in Haiti. Haiti. Haiti! 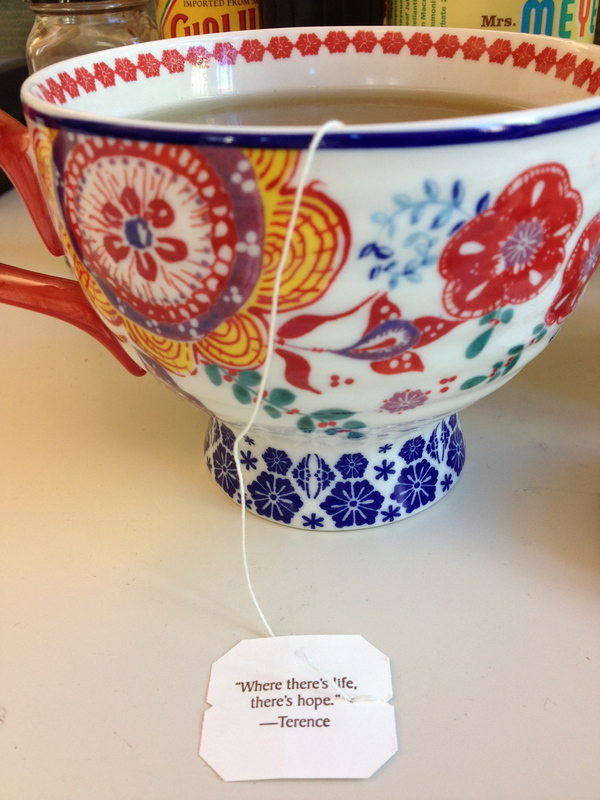 Yesterday this tea-ching graced my cup of mint tea. Where there’s life, there’s hope. It got me all fluttery inside for upcoming adventures in Haiti. I am eager to take it all in. Be open and accepting and spontaneous and observant. I’ve not always been good at letting my younger sister be my guide, but there’s no question she will be this time. I will embrace the “us” in trust. The first thing I did when I woke up this morning was make balls. 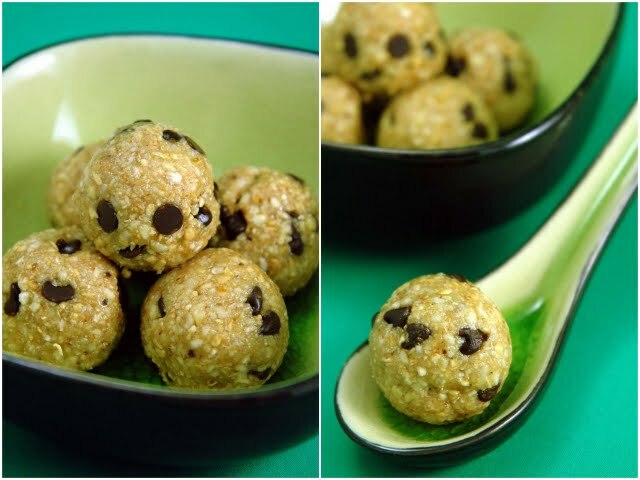 Healthy, raw cookie “dough” balls. Yes. You read that right. And let me tell you something…they are good. All you need is a food processor to pulse the nuts and effectively combine the ingredients. The whole recipe takes about 10 minutes to whip together. The best part is snacking on the extra “dough” that gets stuck on the sides of the bowl. Raw cookie breakfast. It’s a really excellent way to start the day. The original recipe says to keep the balls in the freezer. It’s going to be 98 degrees in Haiti. There are no freezers. But really, what’s the worst that could happen? 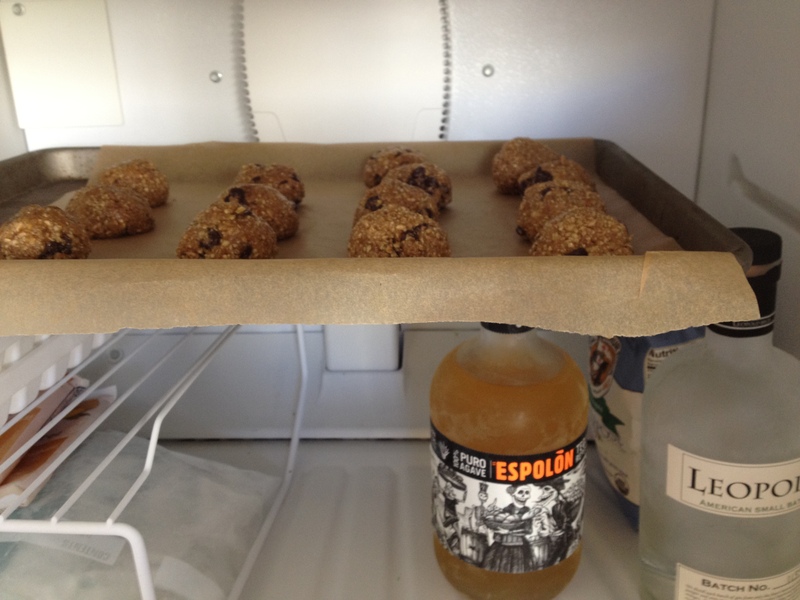 I’ve popped them in the freezer to firm up a bit (look how my bottle of tequila balances the balls!) and will wrap each ball in parchment for the long journey. I think they’ll get a little gooey and morph from round to splat, but I’m hopeful that they’ll still taste good. 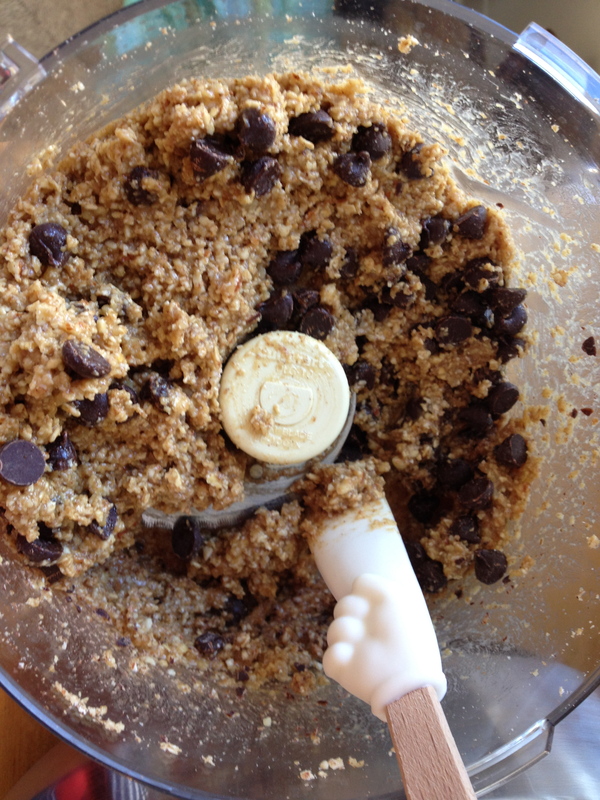 Roll the cookie dough into balls (about 1 tablespoon each) and place them on a cookie pan lined with parchment paper. Place the pan in the freezer for about an hour to firm up. You can store in a tightly covered container in the freezer. Or get crazy and take them to Haiti. Yum, I have to try this! It’s like granola in cookie dough form. Have an amazing time in Haiti, can’t wait to hear all about it!!! Vinite volando, hermana linda! Ayiti cherie awaits you and your balls of magic. xoxoxo and a demen. I’m with Pom on this one! and clear your mind before writing. I’ve had trouble clearing my thoughts in getting my ideas out.